Used Front Frame Rail end for 2002-2006 R50,R53 MINI Cooper and S and 2005-2008 R52 MINI Cabrio. If you've had a minor fender bender and the end of your from frame rail is bent they will tell you that you need an entire new frame rail. But that is expensive and hard to replace. 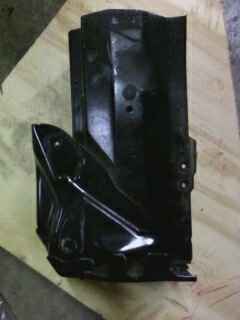 This is just the end of the front frame rail removed from a rear ended car so we know it is straight. As we would cut the end of the bent rail off and simply weld this on to repair it. Passenger frame rail is cut off right in front of motor mount hole. Driver side frame rail is cut off as close to edge of strut tower metal as possible. Sold as left, right or both.